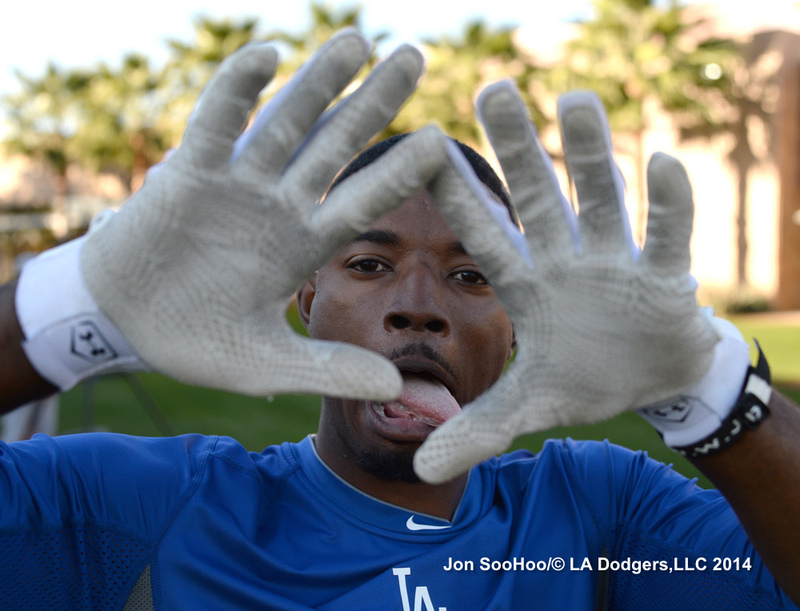 Click here for today’s gallery from Jon SooHoo. 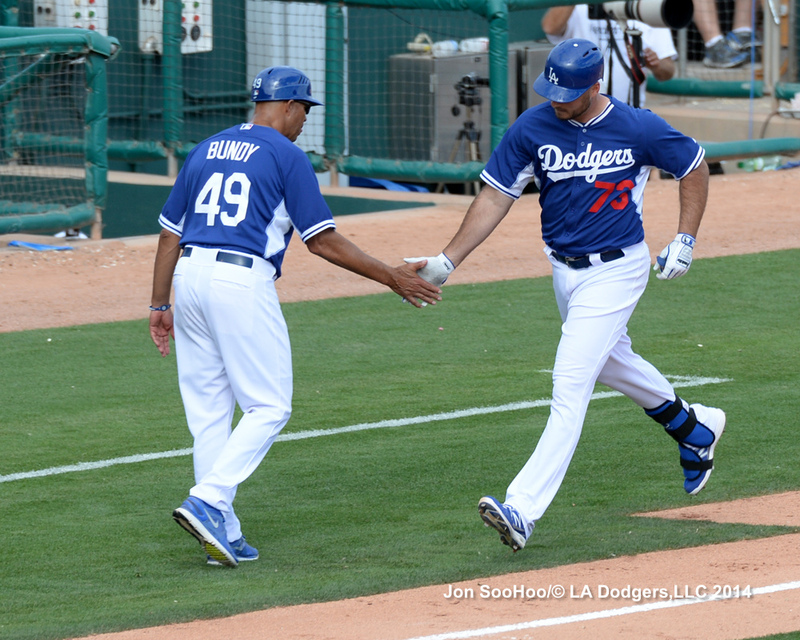 Lorenzo Bundy congratulates homer-hitting Clint Robinson in the eighth inning today. For those of you caught in today’s rain in Los Angeles, it won’t surprise you to find that weather could be a factor for Saturday’s Spring Training game for the Dodgers against the Brewers. Juan Castro, now a Dodger special assistant for player personnel, talked to Ken Gurnick of MLB.com about the challenge faced by Dee Gordon and Alex Guerrero in trying to master second base. Castro said players are instructed on their positioning to take a throw, turn the pivot and get out of the way of the runner. But it’s too dangerous to practice getting taken out by an opponent trying to break you in half from behind. That only happens in the games, and there’s no way to know how a player reacts until it does. With 22 days to go until a potential March 22 start for No. 22, it’s Clayton Kershaw in the spotlight at Opening Day Countdown, whose Mark Newman wonders if Kershaw could someday become the greatest Opening Day pitcher of all time. Monica Barlow, public relations director for the Baltimore Orioles, passed away from cancer at age 36. There are several tributes to her online, such as this from Peter Schmuck of the Baltimore Sun. It was a feel-good day for the pitchers on both the Dodgers and the Chicago White Sox … and then Joc Pederson came to the plate. Pederson, understudying for Scott Van Slyke in right field today, followed a Clint Robinson single by slicing a ball the opposite way over the left-field fence, breaking a seventh-inning scoreless tie and lifting the Dodgers on their way to a 5-0 victory over Chicago. Robinson himself hit a homer in the eighth inning that capped a three-run rally and gave him three hits in six Cactus League at-bats so far. Robinson’s pull shot to right field followed a walk and stolen base by Dee Gordon, a double by Mike Baxter and a sacrifice fly by Brendan Harris. While the good times ended abruptly for the White Sox hurlers, they rolled right on for the home-clad Dodgers. Hyun-Jin Ryu became the first Dodger starting pitcher at Spring Training this year to complete two scoreless innings, allowing two hits with no strikeouts. Brian Wilson, Kenley Jansen, Chris Perez, J.P. Howell and Jamey Wright each followed with scoreless innings, with Matt Magill throwing 38 pitches in two frames to wrap things up. Los Angeles lowered its Cactus League ERA through three games to 2.33. The Dodgers have yet to allow a home run in 27 innings of Cactus League play. A total of 13 Dodger pitchers have combined to allow one run in their past 16 innings. The Dodgers signed two players from Thursday’s open tryout at Camelback Ranch, righthanded pitchers Danny Keller and Steven Edlefsen. Edlefsen, 28, is a seven-year veteran of the Giants organization, including 26 2/3 innings in the majors from 2011-12 with a 6.75 ERA and 15 strikeouts against 54 baserunners. Keller, a 21-year-old Woodland Hills native, has three seasons of low-level experience on the Brewers’ farm. 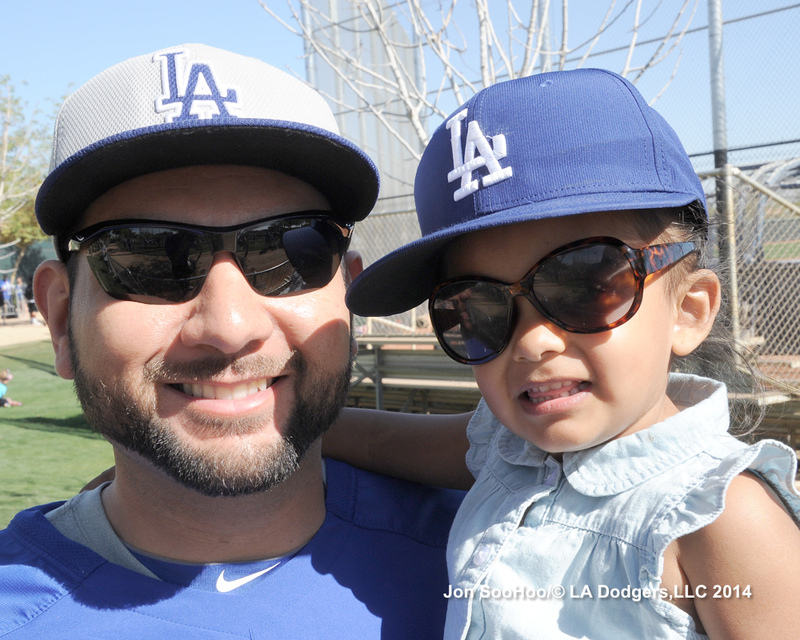 Two fans at Camelback Ranch on Thursday. White Sox vs. Dodgers, 12:05 p.m.
Today’s health-and-well-being blotter from Ken Gurnick at MLB.com includes updates on Matt Kemp, Zack Greinke, Carl Crawford, Brandon League, Chad Billingsley, Scott Elbert and a new name, Ross Stripling. Stripling will undergo a contrast MRI on his right elbow, which came up sore nearly a week ago. And as Eric Stephen of True Blue L.A. notes, Stripling made the rookie mistake of not telling someone right away, and pitched two innings Wednesday after the soreness materialized. “We didn’t hear a thing about it. He didn’t tell a trainer, and didn’t tell a coach. 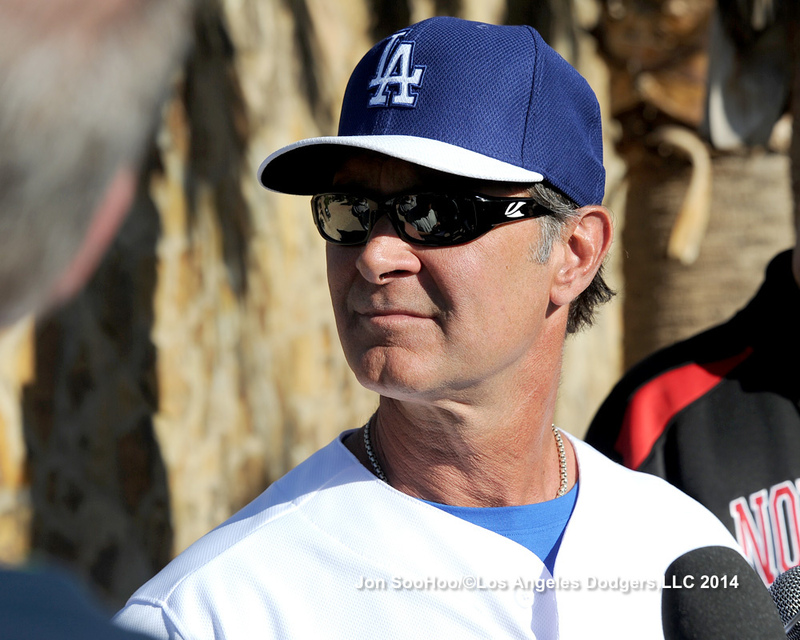 It’s one thing we talk about with young guys, it happens every spring,” Mattingly said. “You ask them to let somebody know, but they don’t want to tell anybody because they want to compete. As for the others, Gurnick said that Greinke might play catch as soon as today, that Kemp had his MRI (that might or might not clear him to begin running) on Thursday but results haven’t been announced and that Crawford is expected to play Saturday. Gurnick also added via Twitter that League (lat strain) is throwing a simulated inning against Kemp and that Billingsley said he will begin throwing breaking balls on Saturday. In addition, Gurnick reported that Scott Elbert threw off a mound today for the first time since his January appendectomy. J.P. Hoornstra of the Daily News has more on Billingsley. Want to know how to access and transfer your paperless online tickets? Here are five quick and snappy instructional videos to guide you through the process, hosted by our friend Courtney Jones. Well, this puts a period on the sentence that was my last big paragraph of filmgoing for a while. Now that I’m working for the Dodgers, my years of going to movies by the bushel will take a break. I saw nearly 60 of 2013’s films, but that number is going to come crashing down in 2014. So for perhaps the last time for a while, here is my annual ranking of the films, using the system I designed long ago. Ambition (1-7): How much the film is taking on, in subject matter and in filming challenges? Quality (1-10): As objective as I can be, how well do I think the film succeeds in achieving its ambitions? Two last quick points: I wouldn’t get caught up in single-point distinctions – those don’t amount to a significant difference between films. I could tinker with the grades every time I revisit the list. If you want to look back, here are four past charts: my favorite films of 2012, 2011, 2010 and 2006. Blue Is the Warmest Color 3.5 9.5 10.5 23.5 Loved the deep, patient exploration of the arc of a relationship – it at once had an intimate and epic feel. Gravity* 5 8.5 10 23.5 No film mixes cinematic and spiritual ambition better this year. A thriller in more ways than one. Short Term 12 4 9.5 10 23.5 Spot-on great storytelling of both a character and a place. Much Ado About Nothing 4 8.5 10.5 23 A movie that I found easy to cherish – a loving and lovable homage with its own originality. 12 Years a Slave* 4.5 9 9 22.5 Unassailable in its worth and inner integrity. I can’t explain why at times I felt numb. “Roots” had more impact. Her 4 8.5 10 22.5 Takes what could have been a sitcom story and turns it into something extraordinary and moving. Saving Mr. Banks 4 8.5 10 22.5 Strong movie throughout, and the stuff about the flawed fathers got to me. Captain Phillips 4 8.5 8.5 22 Intense. Hanks builds to some phenomenal moments. Somali parts well-played. Dallas Buyers Club* 4 9 9 22 Legitimately strong story that should transcend qualms about who the protagonist is. Leto is amazing in it. The Way Way Back 4 8.5 9 22 Touching and sincere. August: Osage County* 4 8.5 9 21.5 Adeptly juggles numerous stories and got at the true contradictions of family life and love. Underrated at Toronto. Mud 3.5 9 9 21.5 Really engrossing story, superbly acted by the kids. Troubled somewhat by the ending. The Past 4 9 8.5 21.5 Another complex multi-person relationship drama. Tough but good. The Place Beyond the Pines 3.5 9 8 21.5 Very strong, though Mendes’ character would have benefited from more development. All Is Lost 4 8 9 21 Taut and nearly silent, but the main question was, why wasn’t their cursing in every minute? Inside Llewyn Davis 4 8 9 21 A good personal journey movie, that maybe stops short of the knockout punch its ending should have. Frozen 4 8 8.5 20.5 Definitely more depth than advertised, but also strong in humor and music. Didn’t quite get why secret had to be a secret. The Wolf of Wall Street 4 8.5 8 20.5 As a comedy, very ambitious with some great moments, but also lagged for me in places. What Maisie Wants 4 7.5 7.5 20.5 A rough story to tell but it works. The Iceman 3 9 8 20 Rock solid, with Michael Shannon giving dominant performance. Blue Jasmine 4 7.5 8 19.5 Hits some great notes – liked even if I didn’t love. Despicable Me 2 3.5 8 8 19.5 Worked very well – I think I liked it more than the original. Enough Said 3.5 7.5 8.5 19.5 Loved the exploration of a mature relationship, just wish big reveal hadn’t been so delayed and sitcommy. I miss Gandolfini. Prisoners 4 8.5 7 19.5 Strong, gritty movie, a little slow-paced in first half but pays off. Stories We Tell 3.5 8 8 19.5 A really interesting film if a bit rough around the edges. The Disappearance of Eleanor Rigby* 4 7 8.5 19.5 Liked the material overall and the two-part experiment, but not convinced it wouldn’t be better as one piece. Fruitvale Station 3.5 7.5 8 19 Narrowly focused but important and heartbreaking. How I Live Now* 4 7 8 19 The quest is a weird one, but it’s a beguiling fantasy. Labor Day* 3.5 7.5 8 19 Liked this maybe more than I should – kind of a indie-spirit Hallmark movie. The Armstrong Lie 3.5 8.5 7 19 The crazy denial comes to life. 42 3 7.5 8 18.5 Liked the acting more than the script – mostly a paint-by-numbers telling of a great story. Nebraska 3 8 7.5 18.5 Might be selling short its ambition, but though I enjoyed it, not sure what it adds up to. Philomena 3 8 7.5 18.5 Pretty intimate and well-told story. The Spectacular Now 3.5 8 8 18.5 Touching. Liked that drinking was key element but not central. Shailene Woodley too adorable to be an outcast, though. Admission 3.5 6.5 8 18 Underrated – didn’t all ring true, but hard not to notice the attempt. Bad Words* 3 7 8 18 At times profane for the sake of it, but among the most fun films of the year. Can a Song Save a Life* 4 7 7 18 The joy of making music. Even its darkness is kind of bright. Tremendously likeable. Casting By 3 8 7 18 Nice piece of work on an area that deserves attention. In a World … 3 8 7 18 Fun story and a nice showcase for Lake Bell. Picture Day 3.5 7.5 7 18 Tatiana Maslany expectedly adorable, and it was an interesting (and slightly strange) ride. The Invisible Woman 3 8 7 18 Solid period piece, with Fiennes beguiling as Dickens. To the Wonder 3.5 6.5 8 18 Eloquent, beautiful love story sandbagged by inexplicable lack of attention to Affleck’s character. Out of the Furnace 3.5 7 7 17.5 More true grit, a la Prisoners, which perhaps was better because its antagonist was better. Lee Daniels’ The Butler 4 6 7 17 Worthy subject and occasionally moving but far too on the nose in places. Night Moves* 3.5 7 6.5 17 Low, low-key film struggles toward the end after it all goes down. Rush* 4 7 6 17 Beautifully shot with good lead performances, but fairly conventional storytelling for a sports film. The Croods 3 7 7 17 Ends on a good note but kind of tedious in the midsection. Turbo 3 7 7 17 No great leap but a likable enough tale. American Hustle 3.5 7 6 16.5 I’m probably being harsh on it, but was not involved in the story until the final hour, and it didn’t stick with me after. Austenland 3.5 6.5 6 16 Points for the ambiguity in the love story, points against for its clumsiness. Oz the Great and Powerful 4 5.5 5 15.5 Uninvolving script and really questionable casting. Monsters University 3 7 5 15 Harmless but pointless for me. The Incredible Burt Wonderstone 3 5 6 14 Gross miscalculations about Carell, Carrey and Wilde characters undermined what might’ve been a really good comedy. Spring Breakers 3.5 5 5 13.5 Certainly not your typical Spring Break movie, certainly stylish, but did not make me care at all. This year’s emperor with no clothes. Planes 3 5 4 13 A sorrowful rehash of past aspirational animations. Before Midnight 3 5.5 4 12.5 Pretentious as ever in the first half, hardly groundbreaking in the big fight in the second. The love for these films remains mystifying. Dom Hemingway* 3 4 3 10 Aside from a couple good moments, thought this was pretty much flatulent. You Are Here* 3 3.5 3.5 10 Matthew Weiner’s feature was the biggest disappointment of the year. 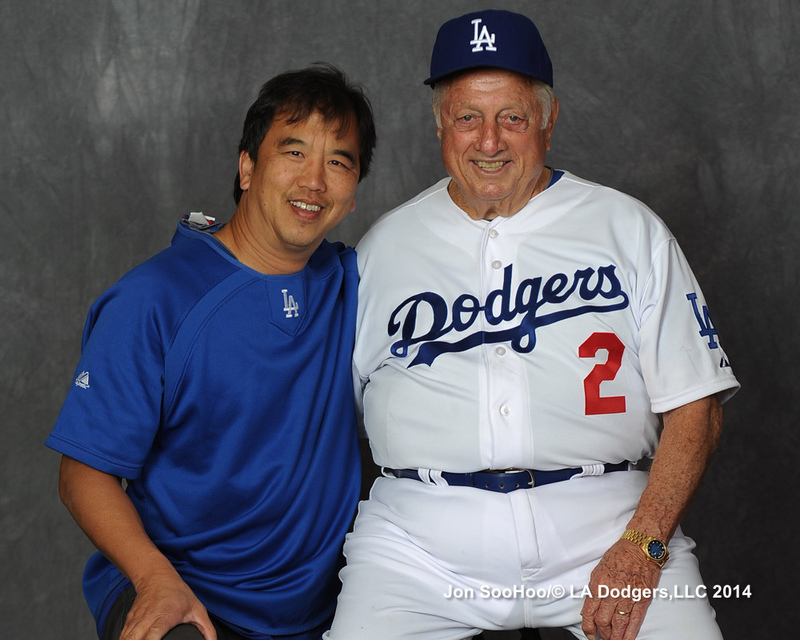 Click here for today’s Jon SooHoo gallery. The first big conference at the mound of 2014, pictured above. … “I just felt something in my calf,” said Greinke. “Just try to take care of it this early in spring. Hopefully it’s not a big deal. I think it’s minor. We’ll see in a couple of days. Right now, I don’t feel too bad.”Greinke said it felt like a cramp and that when he’s had them in the past, he would walk it off and the muscle would loosen. This time he took a few steps, but the discomfort remained. He said he might have been able to pitch through it if this had been the regular season, but nobody would let him continue at this point unless he was 100 percent. Greinke was scheduled to pitch two innings, with an additional 15 pitches in the bullpen afterward. The Dodgers mapped out a schedule for starters Clayton Kershaw, Greinke, Hyun-Jin Ryu and Dan Haren to make four Cactus League starts each and would pick two of them to start against Arizona in the Opening Series in Australia. Greinke, who recently started a stir when he said there was “absolutely zero excitement” about going to Australia, is now likely eliminated as an option, although he disagreed. You can stream the first episode of SportsNet LA’s “Backstage: Dodgers” at ineedmydodgers.com. The Dodgers have the best lineup in the National League, second only to Boston in MLB, according to Marc Normandin of Sports on Earth. 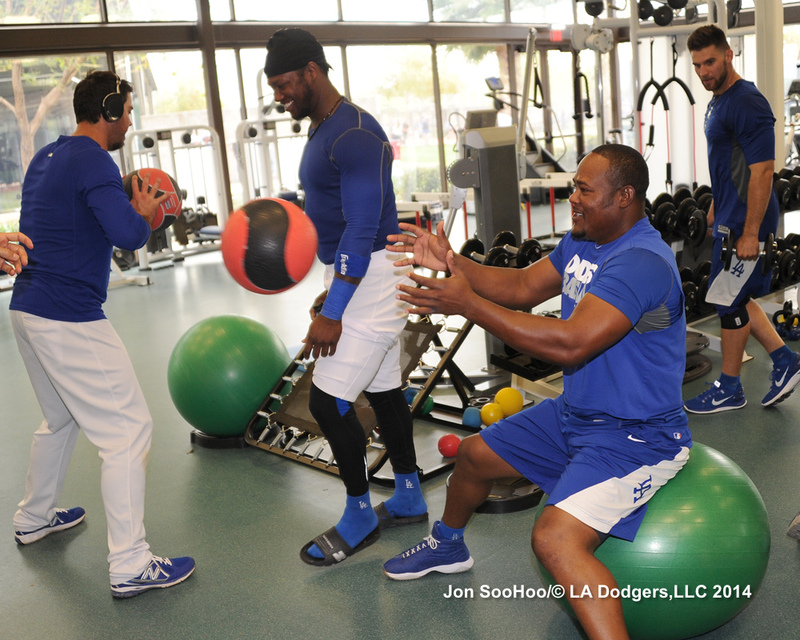 The Dodgers could easily have baseball’s best lineup in 2014. The problem is that they just as easily could miss out on this list altogether due to potential injuries or ineffectiveness from a huge portion of their lineup. That risk has them in the two spot, but it’s no insult: this lineup is absolutely stacked, and if things come together for them, they are going to crush many, many baseballs. If you buy only one Volcanic Jalapeno Beef Jerky this year, make sure it’s the Game On Volcanic Jalapeno Beef Jerky endorsed by A.J. Ellis. Roberto Baly gives us a taste at Vin Scully Is My Homeboy. Mark Saxon tells the story behind the story of October’s Scott Van Slyke-Joe Kelly staredown at ESPN Los Angeles. The Ron Fairly 1961 Union Oil Dodger Family Booklet, at Blue Heaven. I mean, someone really went to a lot of trouble with these. 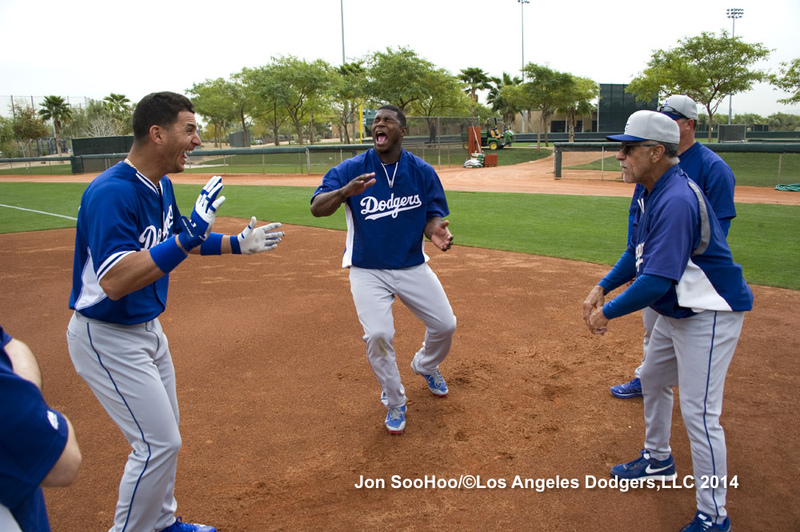 He hit the Dodgers’ most dramatic home run of 2013, and now he has the Dodgers’ first home run of Spring Training 2014. Juan Uribe’s high, high fly ball to left field pierced the sky before just clearing the left-field fence in the fourth inning of the Dodgers’ 4-3 victory over Arizona at Camelback Ranch. The homer by the famed Uribear tied the game at 2, two innings after Uribe’s soft bloop single scored Adrian Gonzalez with the Dodgers’ first run. Miguel Rojas spearheaded the Dodgers’ go-ahead rally in the bottom of the seventh, leading off with a sharp single to center and going to second on a wild pitch. After Nick Buss was hit by a pitch, fellow reserve candidate Brendan Harris singled home Rojas. Alex Guerrero then hit a blooper to short left-center (ruled a single and an error) with two out in the bottom of the eighth inning to bring home one more run. For the second day in a row, a Dodger reliever with an outside chance of making the active roster struck out the side. Today, it was Daniel Moskos, who fanned Mike Jacobs, Matt Tuiasosopo and Jake Lamb. But the top relief performance of the day came from Red Patterson, who retired all seven batters he faced, striking out two. Sam Demel, converted third baseman Pedro Baez and Jarret Martin also pitched shutout innings. Carlos Frias would have as well, but with two out and a runner on third in the bottom of the ninth, Buss lost his grip at the last moment of a diving catch attempt that would have ended the game, but instead went for an RBI double. Scott Van Slyke then succeeded with a diving catch in right field to prevent the tying run from scoring and wrap things up. Chris Withrow, pressed into early action thanks to the calfinated Zack Greinke, allowed two runs on two hits and three walks while striking out one. He ended up throwing 42 pitches in his 1 1/3 innings. Andre Ethier joined Uribe and Guerrero in the two-hit club. Zack Greinke was two pitches into his second batter of the game today at Camelback Ranch when Stan Conte and Don Mattingly had to come to the mound to check on him. After throwing two practice pitches, Greinke walked off the mound. Vin Scully said Greinke seemed to be indicating something with his right leg or knee. After retiring leadoff batter Tony Campana on a fly ball, Greinke seemed to favor the leg on his first pitch to Cliff Pennington. He threw one more pitch before the visits to the mound happened. Update: It’s a right calf issue. Greinke removed from game after throwing 4 pitches. Precautionary measure with right calf issue. He’s with trainer in clubhouse. Diamondbacks vs. Dodgers, 12:05 p.m.
Carl Crawford and A.J. Ellis are being held out of action today by the Dodgers. Crawford has a tight right hamstring, reports Ken Gurnick of MLB.com, while Ellis was suffering from the flu. It was Crawford’s left hamstring that put him on the disabled list in 2013. According to J.P. Hoornstra of the Daily News, Ellis came in to work today but was sent home. “He didn’t look great,” Mattingly said. I look at the image of Seth Rosin above and it makes me ask … at the end of the day, what’s it like — what’s it really like — to take the mound knowing that with virtually every outing, your future is on the line? You can read the text from yet another great Vin Scully story, told on the launch of SportsNet LA, of how he once wore a Dodger uniform during a game, thanks to Ernest Reyes of Blue Heaven. Matt Kemp could get the go-ahead to increase his running after an MRI on Friday. Ken Gurnick of MLB.com explains. 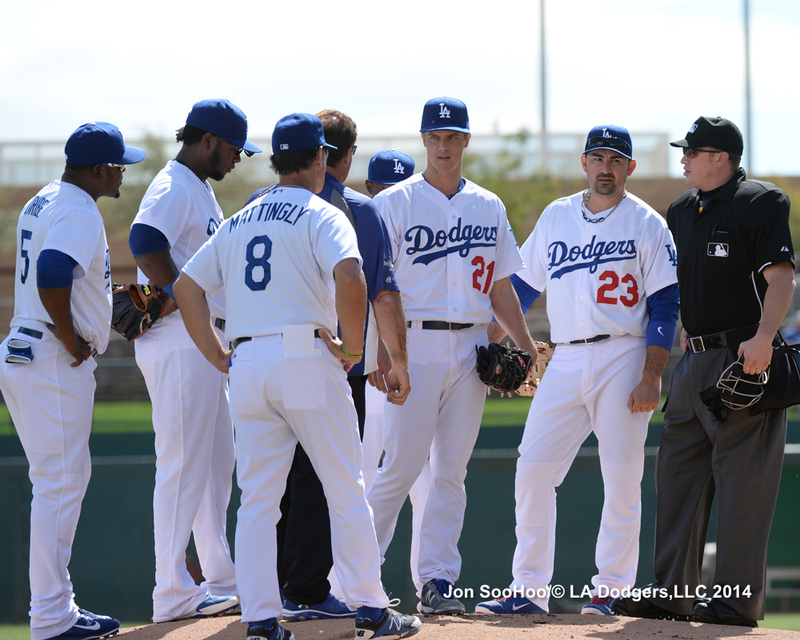 The Dodgers’ annual open tryout will be held Thursday at 9 a.m. local time on the minor league side of Camelback Ranch. Those wishing to participate must not be enrolled in high school, on a collegiate roster or be under contract with any Major League club. Additional information is available on the Dodgers Scouting Hotline at (323) 224-1512. Steve Yeager had 14 steals in his MLB career, but one of them was a steal of home. Stephen shares the story at True Blue L.A.
Heisman Trophy winner Jameis Winston is serious about also pursuing baseball as a two-sport athlete, writes Andy Staples of SI.com. Seth Rosin, who needs to stay on the Major League roster all season for Los Angeles or risk being shipped back to the New York Mets, stole the show for the Dodgers during their 4-1 loss to Arizona today in their Spring Training opener, striking out five Diamondbacks in his two innings. In the sixth inning, Rosin fanned Arizona regulars Aaron Hill, Paul Goldschmidt and Martin Prado all in a row, after striking out Matt Tuiasosopo and A.J. Pollock in the fifth. Yasiel Puig hit the ball hard in all three trips to the plate, earning a single, an RBI double and a tough groundout to third. 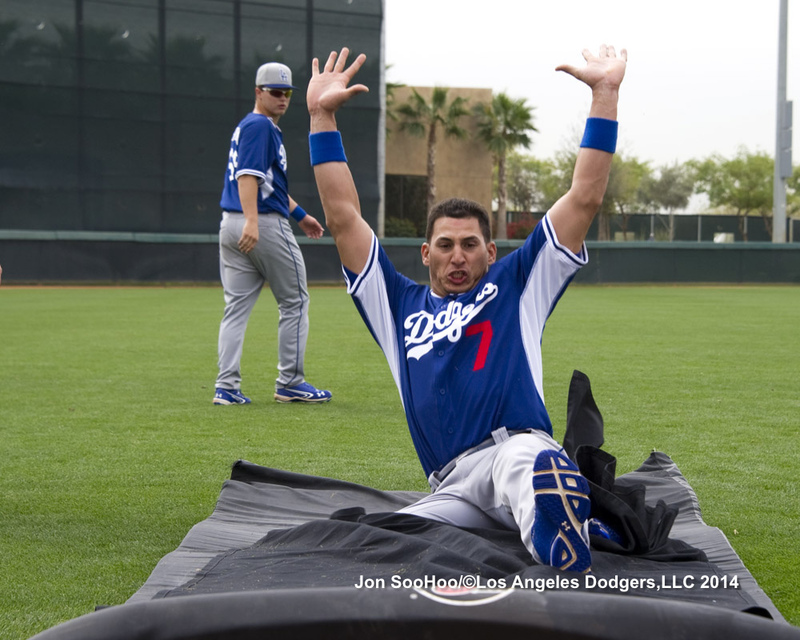 Second baseman Alex Guerrero looked fairly smooth on two plays in the third inning, making a diving stop on an infield single, then serving as a middleman of a 6-4-3 double play with Chone Figgins and Scott Van Slyke. Guerrero went 0 for 2 at the plate. 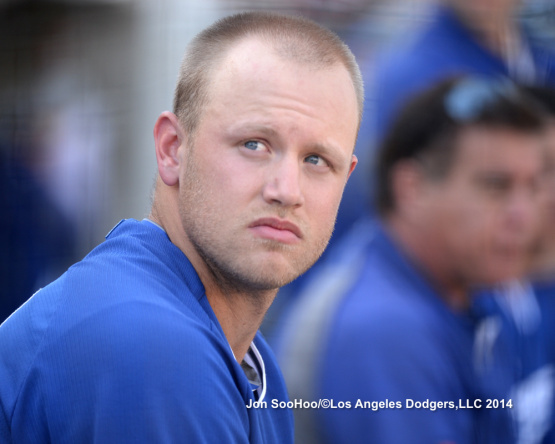 Van Slyke had a single and a walk, then was replaced by non-roster invitee Clint Robinson, who also singled. Designated hitter Justin Turner also singled and walked. Figgins went 0 for 3, but was nearly 3 for 3. Mark Trumbo, somewhat surprisingly, made two diving catches of balls Figgins hit to left, and in between, Figgins was foul by inches on what would have been an extra-base hit to deep right. Jose Dominguez struck out two of the three batters he faced. Though he had a bit of trouble in left field behind Clayton Kershaw, Carl Crawford went the opposite way for a single in the third inning, then scored from first on Puig’s double. Dodger pitchers Kershaw, Javy Guerra, Rosin, Dominguez and Ross Stripling struck out 11 and walked one in their eight combined innings. In his second inning of work, Ross Stripling allowed three singles for a run in the bottom of the eighth to produce the final margin. Stripling induced a double-play grounder to end the inning. Bearing in mind that the Dodger roster could change practically every day once the regular season begins, much needs to happen between today’s Cactus League opener and the games in Sydney, San Diego and finally Los Angeles. Dodgers vs. Diamondbacks, 12:10 p.m. 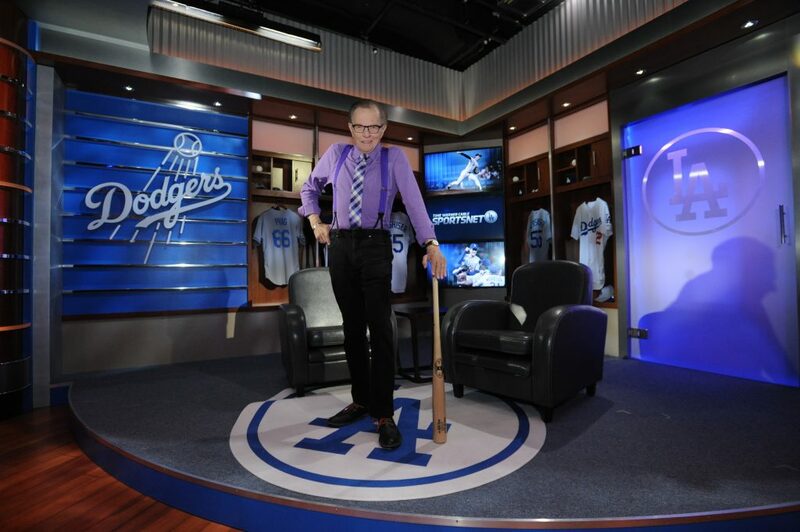 Longtime TV/radio host Larry King will take the helm of “Larry King At Bat,” where he will interview celebrities, baseball legends, Dodger personalities and other luminaries in a series of hour-long episodes on SportsNet LA. The new series was announced tonight shortly after SportsNet LA launched with “Access SportsNet: Dodgers” and will premiere March 18 at 7 p.m., with Orel Hershiser as the interview subject. 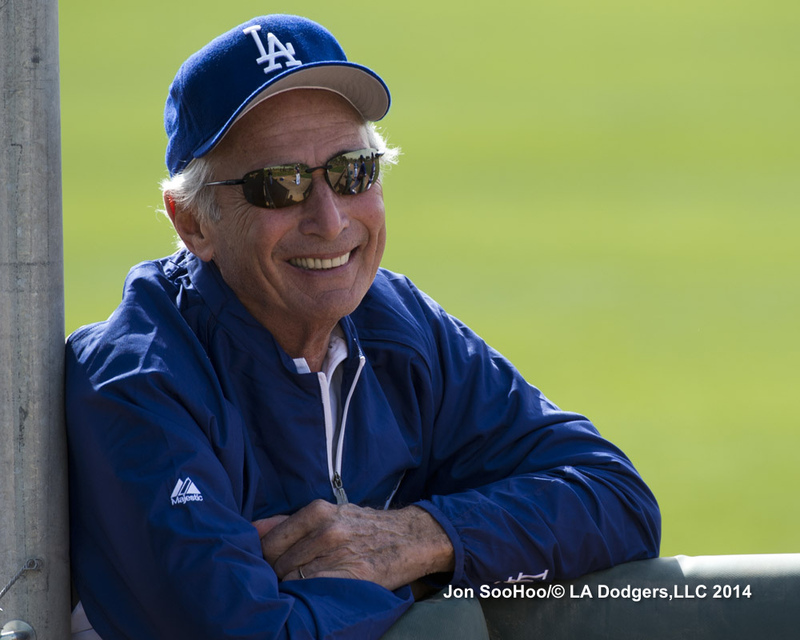 As the warmup period for Spring Training comes to a close and the Dodgers embark upon 21 games in the next 19 days before leaving for Australia, I thought this would be a good time to thank official Dodger photographer Jon SooHoo — whose blog you should be checking out daily — for serving as our eyes into Camelback Ranch.